Published and licensed exclusively through Off The Wall Plays, Dec. 2015. Contact them to buy a reading copy or performance license. Waynesboro Players Community Theater. 4-show run. Feb. 23–26, 2012. 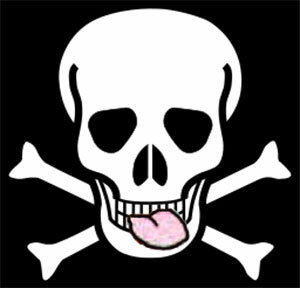 Harken, mateys! Modern piracy no longer has its “good” name — or so claims the Pirate Appreciation Movement. This group of buccaneers believes hijacking a cruise ship on the Talk Like a Pirate Day holiday is the proper route to infamy. Its saltiest members, Walker D. Plank and sidekick Halitosis Halvard, sneak aboard the M.S. Stillwater as it departs for a Caribbean cruise. They discover more than they bargained for in a colorful ensemble of fellow passengers. Frederick Feedle Fillingsworth is a fugitive museum curator with a valuable stolen artifact. Teenaged nerd Paisley Nettleton is a prodigy of ancient languages and archeology, hovered over by his squabbling parents, Ned and Doris. The Captain — the hairiest man of the Seven Seas — would do anything to win the affections of Bridget, the mysterious yeoman. By the time night falls on the first day at sea, a tentacled monster will be summoned, a sword fight will be fought with plastic butter knives, and someone will take a one-way voyage to Davy Jones’s locker. Aye so, but ’tis good to be a pirate!